While we can say with confidence that most of our trips work out as expected, there have been some that did not work out quite as planned. 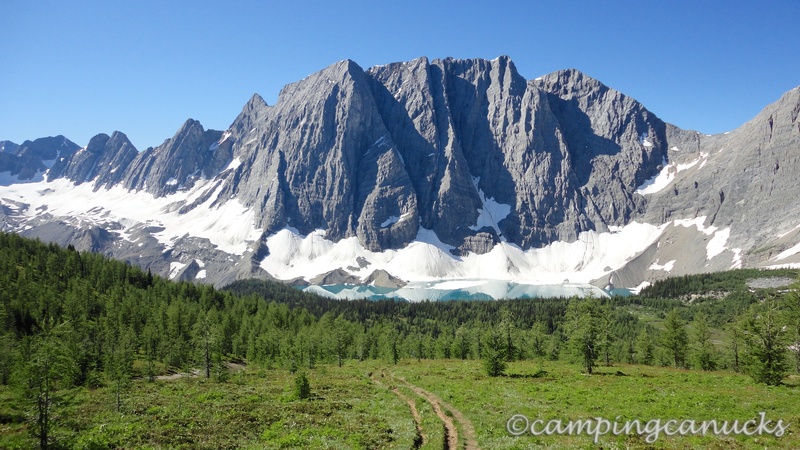 One such trip was our backpacking experience on the Rockwall Trail in Kootenay National Park in 2012. It started with bad spring weather and ended with a cut on a rusty nail and a lopsided outhouse. 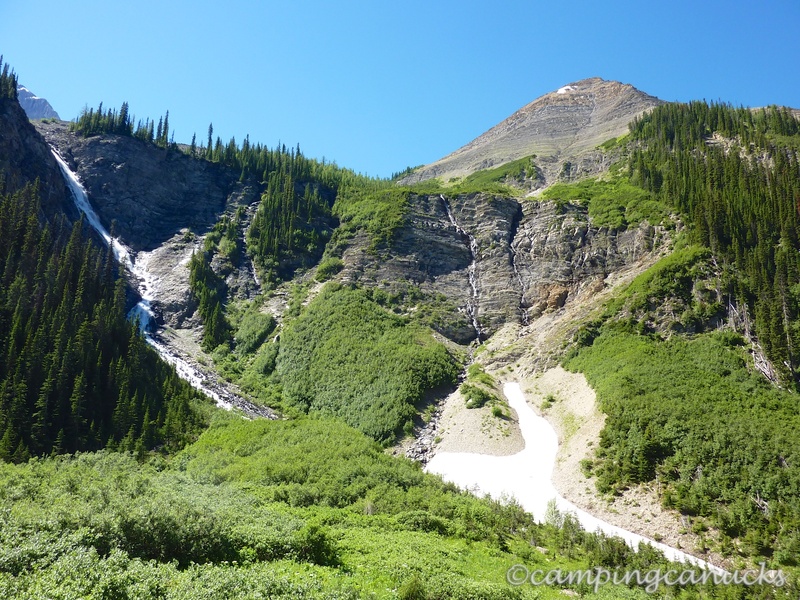 The Rockwall Trail is a 55 km trip traversing three alpine passes so we figured we would make it a five day, four night outing in order to take it easy and have some time along the trail for some side trips. 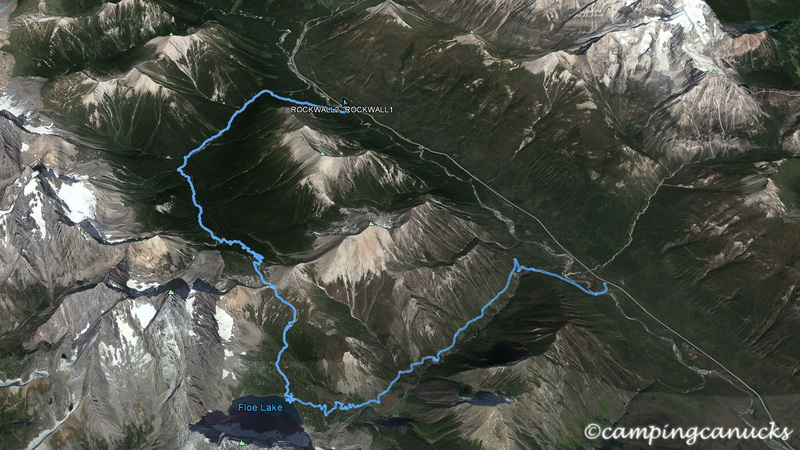 The plan was to enter on the Floe Creek Trail and exit from the Helmet Creek Trail, where we would leave a vehicle at each end. However, plans had to be changed in the weeks prior to the trip due to heavy late spring rains. 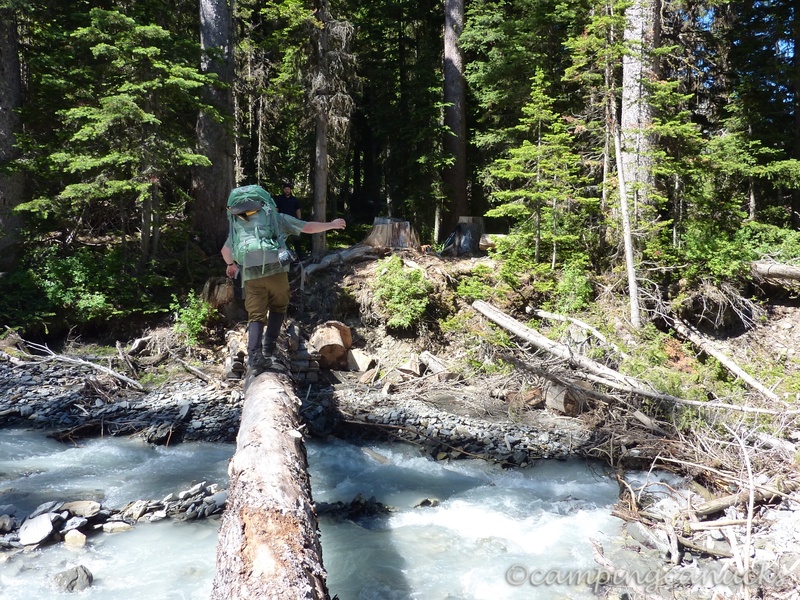 For starters, several key bridges were washed out along the latter parts of the trail in the Helmet Falls area and Parks Canada was considering it impassible. 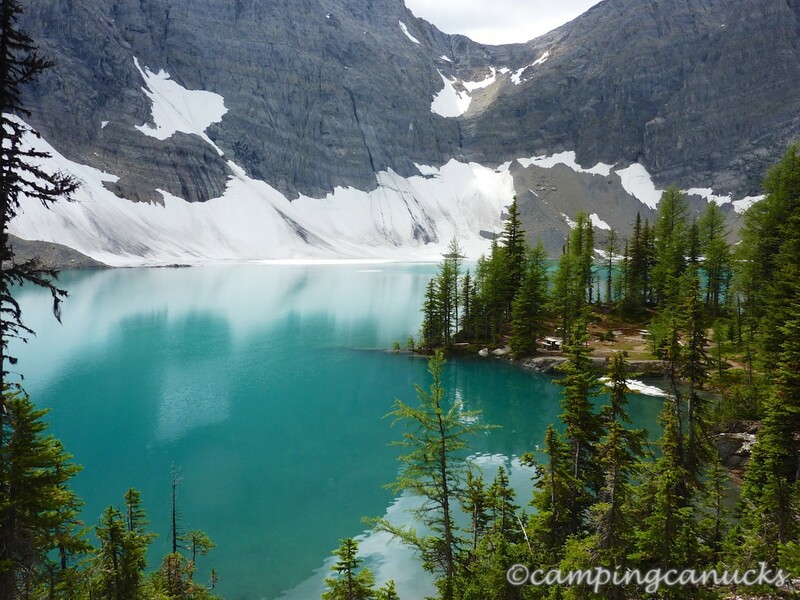 After a call to Parks, we took their advice and cut our trip back to two nights, deciding to just camp at Floe Lake and Numa Creek. We figured we would come back again some other day for the rest of the trail. 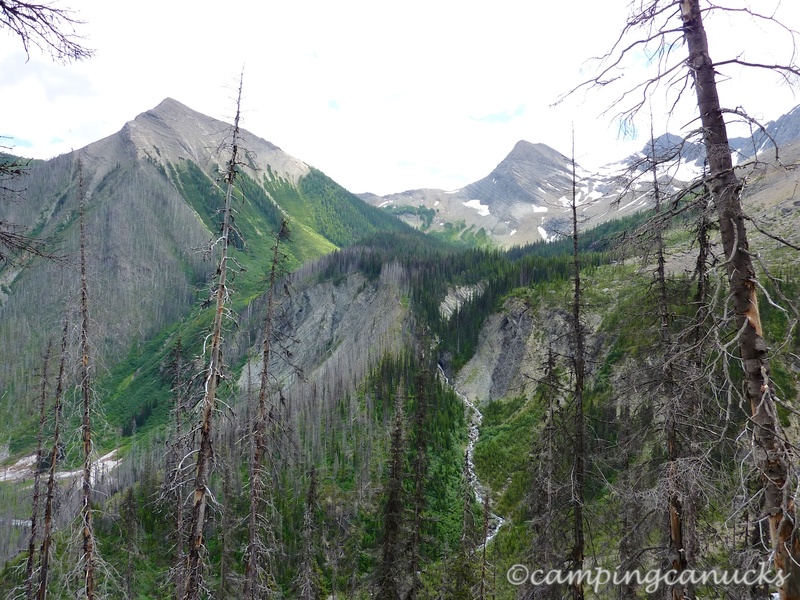 After a night spent in Radium, we hit the trail early in the day on a sunny August morning where we were greeted by the devastation of a forest fire that had raged through the area a few years ago. While it’s not the most attractive site, it was sort of a bonus to be able to have views most of the day rather than just packing through the forest. On the flip side, though, there was a surprising amount of deadfall and trees down across the trail. It is not fun climbing over, under, or around large objects with a heavy pack on. Aside from the occasional scramble, much of the first few hours were pretty straightforward with a long, steady climb. 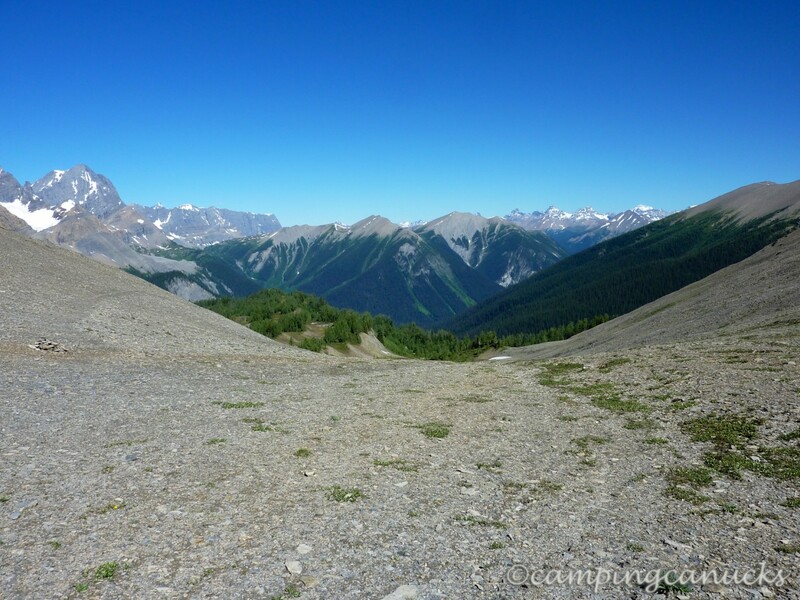 Around the 8km mark, we came to the steepest section of the trail, where the trail gets noticeably steeper and starts to switchback its way up into the alpine. Admittedly, we were not in as good of shape as we should have been and did find it to be quite a haul. Once in the alpine, it was only a couple of more kilometers until we reached the campground. Being that we were among the few people already at the camp, we had a good selection of sites to choose from and were soon set up and ready to settle in for the night. 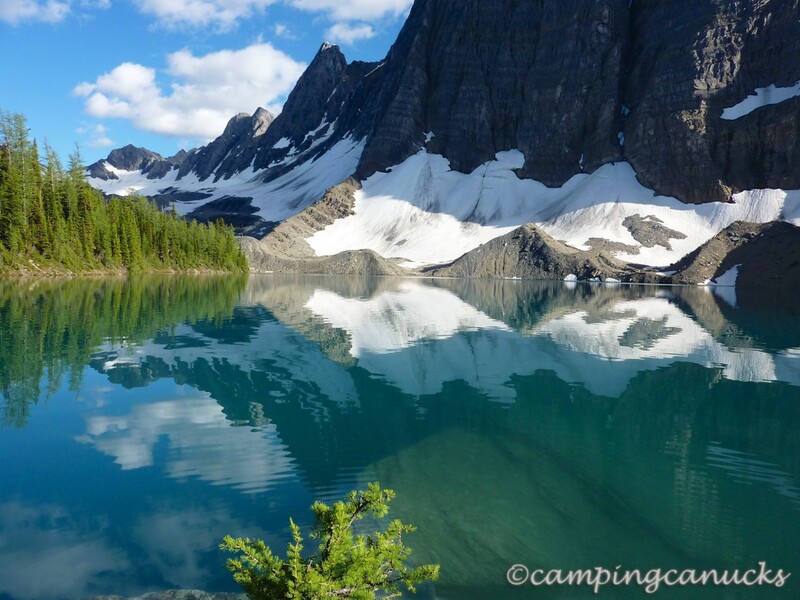 The campground is a typical Parks Canada site with picnic tables, bear bins, outhouses, and a nearby Rangers cabin. As is usual in the backcountry, no fires are allowed. One of the more remarkable features of this area is the massive wall of rock that hangs above the lake, Floe Peak. Being that it comes in at over 900 meters in places, it’s imposing and almost impossible to capture the size of it in a photo taken at the campground. We had to hike a few kilometers away to really capture the sheer scope of the wall. Our first bit of bad luck began at this point, although it was fairly innocuous; first one porcupine, and then later a second porcupine, took over the outhouse. As we came to determine, there is no easy way to kick a porcupine out of a corner if it has decided to stay. 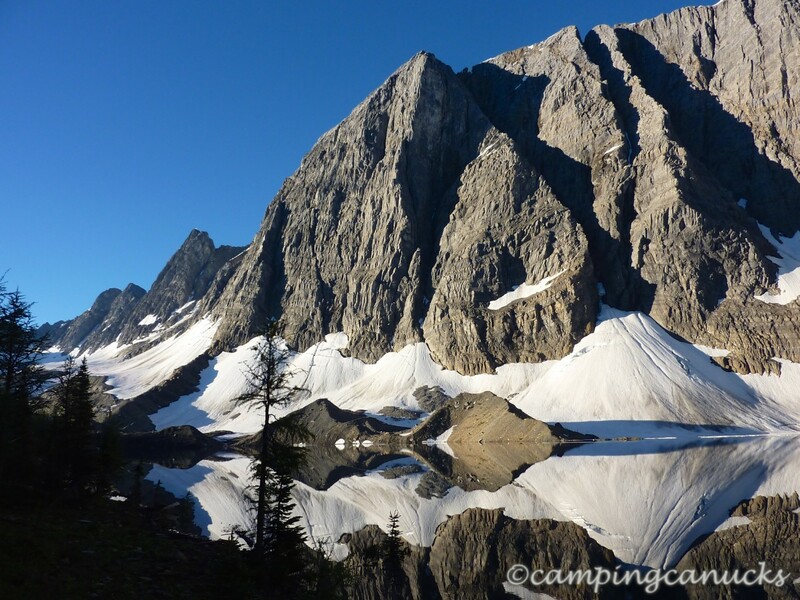 We did a little write up on it in our backcountry toilet post. Luckily after wandering around for a bit, we did find a second, unoccupied toilet on the far side of the camp. Unfortunately, it was also around the time that one of our party cut her arm on a rusty nail sticking out of the outhouse. We cleaned it up and just sort of hoped for the best at that point. As can happen in the alpine, it was a cold night with subzero temperatures so most of us retired early to our tents to stay warm. We awoke to a fantastically clear and cold alpine morning with some of the most stunning reflections off of a lake we have ever seen. On a morning like that, it’s hard not to be in a great mood and we began our day in high spirits. 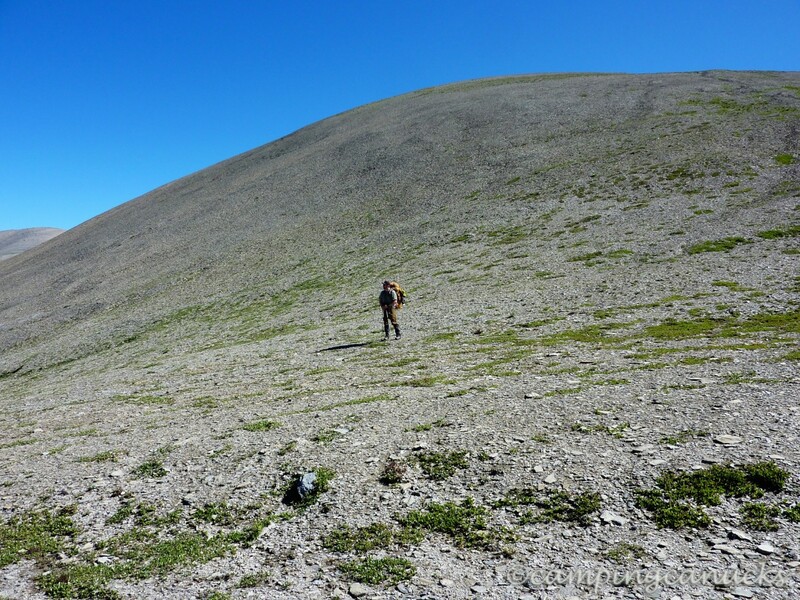 After some breakfast and packing up our gear we were back on the trail heading to the top of Numa Pass, where we would then begin the descent to the Numa Creek camp. This is the stretch of trail where you begin to get above the tree line and the views really opened up as we leisurely made our way to the top. This is also where you can look back and really appreciate the scope of Floe Peak rising above the lake. It was stunning. For people who do this trip from north to south, you are greeted by this sight as you come over Numa Pass. Once up at the top, we took a bit of a break and enjoyed the morning sunshine on this marvelous day. With no clouds and very little smoke in the air, we could see a long ways off and could make out the main section of the Rockwall to the north of us along the Rockwall Pass. It seemed like a fine place to sit for a bit and enjoy a snack before heading down into the valley. After collecting ourselves, we headed on down the trail, slowly descending back into the trees. While not really steep, we did find it a bit hard on the knees in sections, particularly since the descent was so long. But there was still plenty to see along the way. 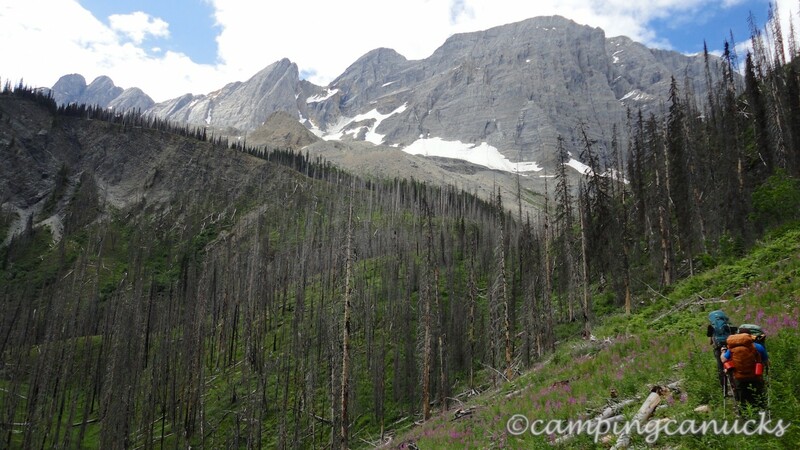 We passed through long sections of old growth forest and many alpine meadows on the way to Numa Creek. Even during August there were still a lot of flowers in bloom as we pushed our way through the meadows. Closer to the campsite, we reached the largest water crossing along the way. One thing about river crossings in the national parks is that you never know what you will be crossing over. Most of the time there is a bridge, but on occasion, you will come across a log or logs spanning across the water. Of course, one can always cross by fording the river or stream, or finding enough rocks to step across, but we chose the log. As it had been dry, it wasn’t really a problem although balance can be an issue with a heavy pack on. If it had been raining, we likely wouldn’t have used the log. A piece of advice for first timers; undo your waist and chest straps because if you fall into the water, you will need to get out of your pack quickly. Otherwise, you’ll likely get dragged down. But we made it across without incident and soon found ourselves at the Numa Creek camp. We’ve seen a lot of national park backcountry camps over the years and quite honestly, the Numa Camp was one of the saddest we have seen. 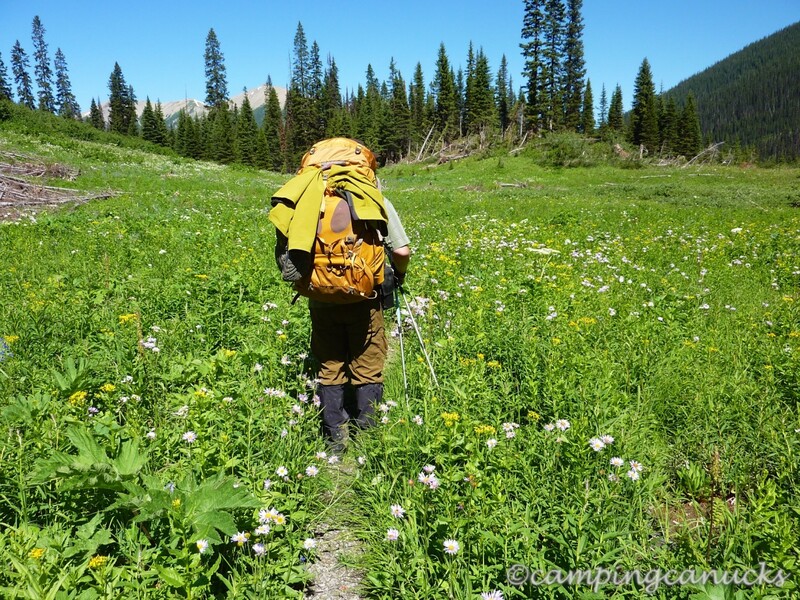 Typically after rolling into a camp, we’ll drop the packs and wander around scoping out the tent pads before selecting a site. We soon found that all of the pads were falling apart. There are a number of different ways pads are made, but in this camp each pad was a sandy surface surrounded on four sides by 4×4 beams. The problem was that most of the pads were missing one or two of the beams and because of that, much of the surface had been washed away by rain over time. So there were pads that were seriously slanted or just a big bump in the middle where all the surface material along the sides had sluiced away. Being that we spend a lot of time in the backcountry, we’re not the most discriminating when it comes to a place to pitch a tent but this really bothered us. It was a clear indication of where Parks Canada did not spend money for upkeep. Up to this point, we were still committed and ready to spend the night; until we scoped out the outhouse. As it turns out, it was almost falling over, and we were all hesitant to use it as we were each afraid it would topple if someone sat down inside. In all likelihood, it wouldn’t have and has stood the test of time (and usage) but this really annoyed us. We sat down and re-evaluated whether to spend the night or just high tail to the highway which at this point was only about 8km away. In the end, due to the state of the camp and the rusty nail cut, we opted to exit a day early and head out. Unfortunately, as we soon discovered, large sections of the Numa Creek trail had been washed out by the heavy rains. This necessitated some bushwhacking and at times, the need to remove our packs in order to continue. Several times along the way, we would have to climb down a bank, pass the packs down, carry them to the other side, climb back up, and pass the packs back up. This ended up being quite exhausting and put most of us in a bit of a foul mood. 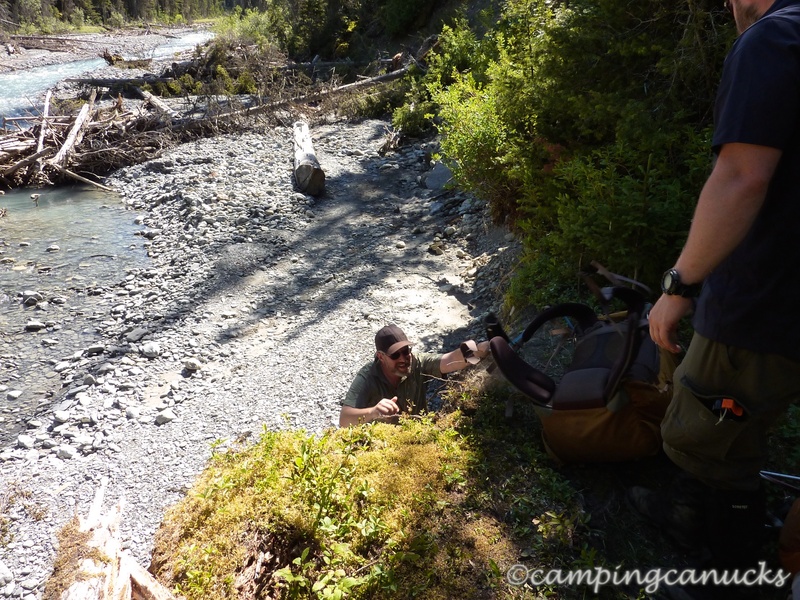 It took more time than expected but eventually we exited at the Numa Creek trailhead where we had a vehicle waiting. And so ended our first trip on the Rockwall Trail. For the most part, this was an enjoyable trip as there was plenty to see and experience and we would certainly like to come back and complete the full trail. Whether we start again at Floe Creek or just pick it up from the Numa Creek trailhead will be a decision we’ll make when the time comes. But at least we can say we didn’t get chased off of the trail by a forest fire, which happened to a friend of ours the following year. We do know that Parks Canada has limited funds and does put most of its money into higher profile trails and the front country areas, but we certainly hope that some attention will be made to the Rockwall Trail at some point. The Rockwall Trail deserves no less.